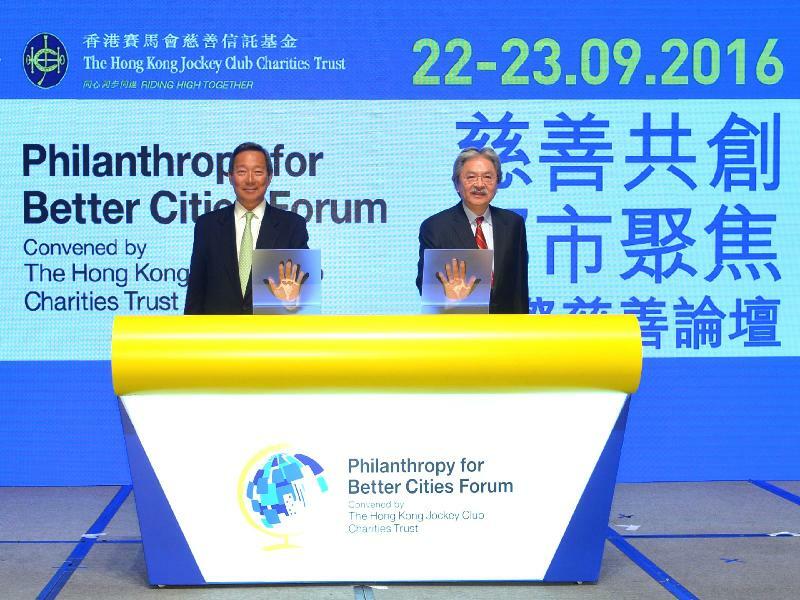 Let me begin by thanking the Hong Kong Jockey Club, our biggest and best charitable organisation as well as our favourite destination on most Sundays and Saturdays, for bringing together experts from all over the world to address a topic of vital and universal importance - philanthropy for better cities. One of the most important roles of government, I believe, is to foster an enabling environment with a set of fair and predictable rules, that accords everyone, rich and poor, the same opportunity to excel, that optimises everyone's potential, and that gives members of the younger generation a fair chance to succeed. An environment in which the new generation can learn and can thrive for themselves, an environment where they can fulfil their aspiration, an environment where they can nurture changes to better our society, our world. For fostering and maintaining that enabling environment, the Government must actively, as well as consistently, invest in social and economic goods for the community, including education, transport, the environment, healthcare, sanitation, housing and whatnot. These, in the words of the 18th century English writer Samuel Johnson, are what they call the "decent provision for the poor". 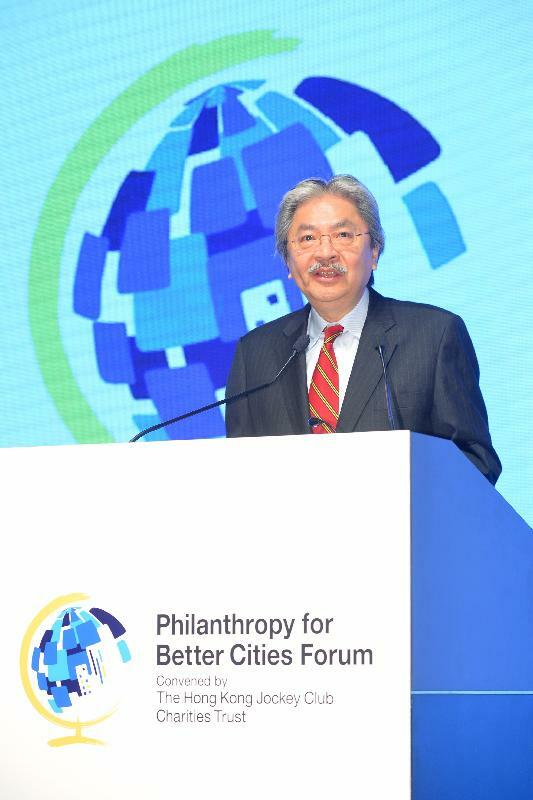 In fact, education, healthcare services, elderly care and support for the disadvantaged are indeed the top priorities for the Hong Kong Government. Over the past decade, provision for social welfare here has more than doubled in real terms. Education spending has risen over a pretty high base by two-thirds. Healthcare by 90 per cent. In my latest government budget, I allocated $72 billion for social welfare, $77 billion for healthcare, $84 billion for education and HK$85 billion for infrastructure. And that accounts for over 65 per cent of the total public expenditure for the current financial year. With Government's intervention and implementation of new schemes like the Old Age Living Allowance, as well as the Low-income Working Family Allowance that were launched recently, we have successfully helped lift thousands of grass-roots households out of poverty bolstered economic security of these families, as well as helped these families to secure real opportunities for their children. We have also been investing heavily in public housing. Many people in the world do not realise that nearly half of Hong Kong's 7.2 million population are actually living in subsidised housing built by Government. As a caring society, Government has been taking an innovative approach in implementing a number of social initiatives, and I am happy to say that many of these measures are beginning to bear fruit. For many years, Hong Kong has developed social programmes not by direct provision through public agencies, but by engaging not-for-profit organisations or private companies in delivering these services. Traditionally, funding was provided through subventions or contract arrangements, but since the 1990s, we have given NGOs greater room to determine how their subventions are used, and we have set up funding programmes to encourage the development of social enterprises that are able to earn and retain income to help them scale up and sustain their activities. We have also set up in 2013 the Social Innovation and Entrepreneurship Development Fund to support social enterprises, to enable them to sustain activities through their own income-generating schemes. The Fund seeks to promote a "Creating Shared Value" initiative and is encouraging established enterprises to rethink the way that they operate and seek new opportunities for business growth by addressing social needs. I also see great synergy for cross-fertilisation between social entrepreneurs and the growing body of technology-savvy talent in coming up with innovative ways to address our social issues. Like many other places, Hong Kong is facing the daunting challenges of a fast ageing population. We expect the proportion of our elderly, that is, people aged 65 or over, to increase from 15 per cent, that is about 1 million people in 2014, to 36 per cent, or 2.6 million people, in 50 years' time. We are proactively employing a number of new ideas and initiatives in dealing with the situation, such as promoting the extension of retirement age, enhancing childcare services, facilitating employment of the underprivileged, attracting overseas talents through special immigration schemes, as well as identifying proper technological applications that can lend the necessary assistance to elderly citizens. We hope, through these initiatives, to optimise the potential of our labour force, nurture local manpower, attract foreign talent to Hong Kong and foster a supportive environment for raising families, as well as for active ageing. We hope, as well, to make the new generation of elders even more healthy, more energetic and fully capable of continuing to contribute to our society. Ladies and gentlemen, while the government has an indispensable part to play in this ongoing exercise, our efforts and public expenditure alone are not enough to tackle all the problems. Private sector support is crucial. Support in the form of money. Support in the form of expertise. Support in the form of philanthropy. It is of paramount importance that the private enterprises, NGOs, charitable organisations and governments all join forces in building that enabling environment. In that regard, Hong Kong is blessed. For many years, not-for-profit organisations and corporate social responsibility programmes have delivered a vast range of social welfare initiatives in Hong Kong. The Government also provides support in the form of subventions and contract arrangements. And we have given NGOs greater flexibility to determine how they can deploy these subventions. I am happy to note that government agencies, NGOs, charitable foundations and businesses are working together to find better ways to address problems and open up new opportunities. Making efforts to understand community needs better and to engage citizens in creating new ways to meet these needs. Still, much more needs to be done. That is where philanthropy that is attuned to society's needs and committed to uplifting society is urgently needed. We need also philanthropy that supports innovation through the trial and error inherent in the process; we need creative philanthropy that looks for new solutions to problems; we need philanthropy that is inclusive and welcomes ideas and efforts from everywhere. Philanthropy that is dedicated to capacity building. Ladies and gentlemen, cities are organic. They change. They grow. Some prosper, some decay. We can build better cities, more healthy and prosperous cities, not only with advanced and well-designed hardware, but also with the powerful software of social consciousness, the enlightened philosophy that animates philanthropy. So once again, my thanks to the Jockey Club Charities Trust for organising this meaningful event and all the inspiring people who have gathered here today. I wish you all a productive conference. Have a great day.